That’s the generally held consensus isn’t it? If a child is removed from a neglectful or abusive situation soon enough, it won’t affect them. Wrong. 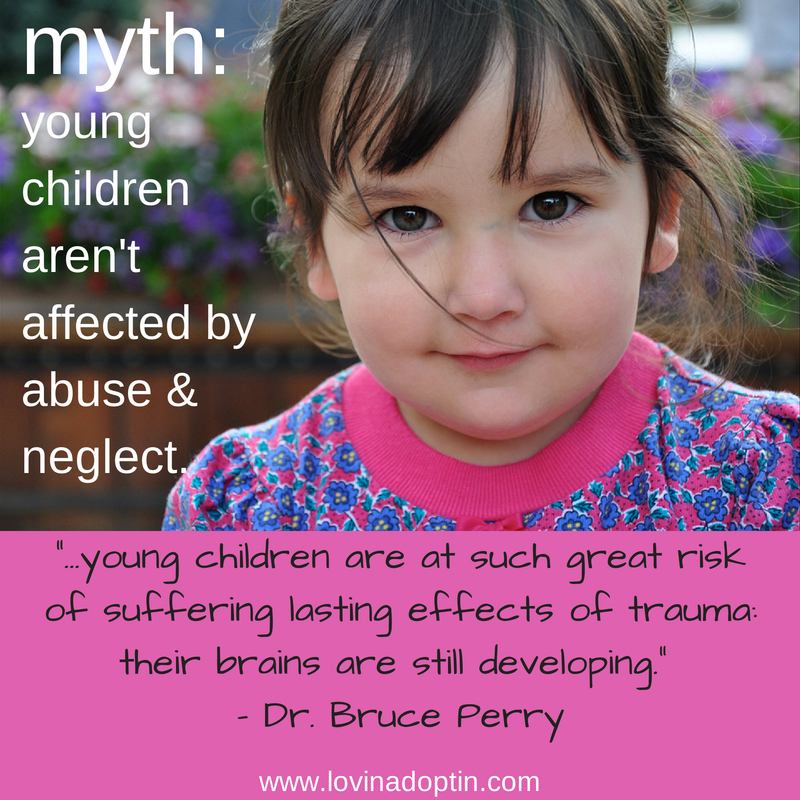 Sure it’s better for them, the hope is that it doesn’t take them as long to heal, but they are impacted as much, or possibly more than an older child. 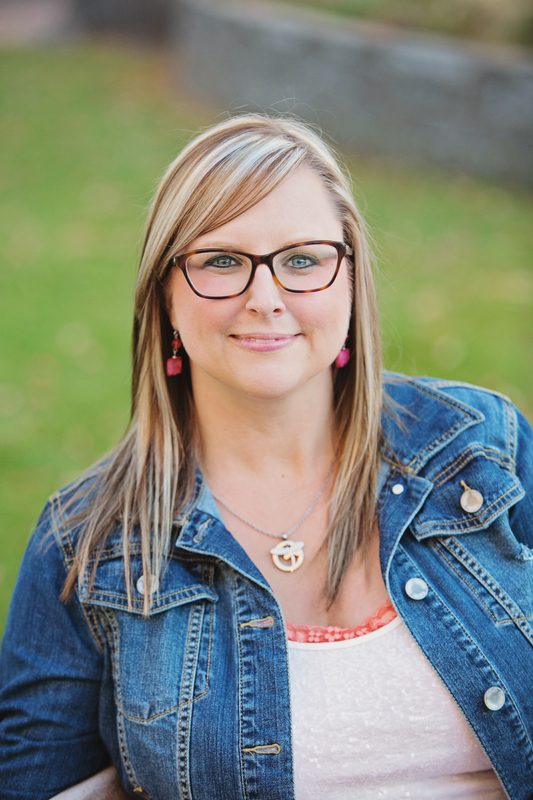 Payton had emotionally shut herself down because of the neglect and trauma she suffered. She would bang her head on the floor, or on a piece of furniture, but no sound escaped her lips. Never having been around a child with a traumatic past, this shocked me. She had learned early on that no one responded when she cried, so why put forth the effort? We didn’t have any specific training in how to deal with this or many other issues that came our way, so I did what came naturally. Every time she fell, or bumped against something, I picked her up, held her against me, and said, “It’s okay, Mama’s here.” (At the time she was in foster care. Her bio mom called herself Mommy, so I referred to myself as “Mama.”) After a couple months of consistently showing her that I would rescue her when she was hurt, Payton began following me around the house! It was more of a curiosity thing, she was making a basic connection that someone cared. True bonding would take years to develop, but we had a base to begin from, and I was excited! During this same time, I was on the floor with her a lot. How did I do this? In my years of parenting a child with attachment issues (actually she was diagnosed with RAD, you can see my opinions on that here) and one with Autism, I have come to see the benefits of a small house. I’m in close proximity to my kids. (If you don’t have a smaller home, you can use baby gates to keep your kids close.) My husband and I also drastically changed our daily routines. Our focus was on our new little girl, who needed as much of us as she could get. I spent as much time as I could on my daughter’s level. She hadn’t learned the basics of play, not even as an infant would. It took a long time for her to learn to play, and even longer to use her imagination. But, she had noticed I was there. She moved from following me around to mimicking me (I have a photo of her at eighteen-months loading the washing machine), and eventually moving on to sitting on my lap, etc. This technique can also be called “Floortime.” I implemented this (in a way) with my daughter before I heard about Stanley Greenspan’s Floortime. We were introduced to Floortime much later when my son was diagnosed with Autism. 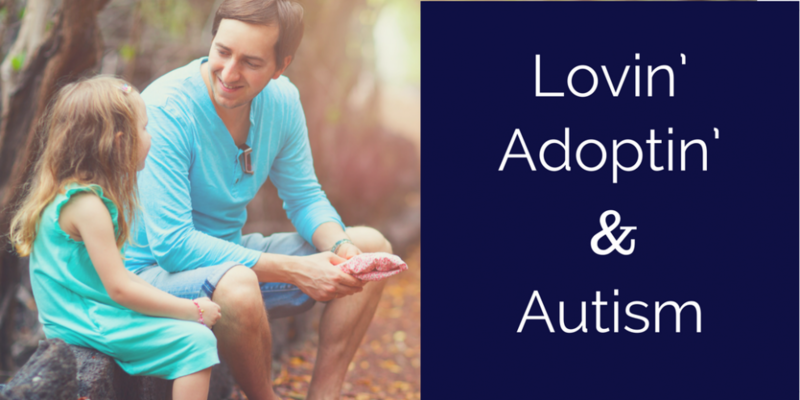 The approach is not specific to Autism, and can be extremely helpful in the bonding between a child with attachment issues and a parent or caregiver. The Developmental Therapist who works with our son uses a mixture of Floortime and other therapies, which I’ve discovered are a foundational component to bonding. We have to return to this cornerstone of Floortime because many of our children don’t know how to play, no one taught them how. Sometimes their brains can’t calm down enough to engage in free or imaginative play. One reason I really love Floortime is because, as quoted above, “…it meets children where they are and builds upon their strengths and abilities through interacting and creating a warm relationship.” Why is this so great? Let’s look at key elements in the statement above. “…it meets children where they are.” – Our hurting children are not at their actual developmental age. We have to meet them where they are so they can climb the ladder of social, emotional, and physical development. There’s no time limit, there is no rush when looking at the developmental age of our hurting children, it will take time. And always remember bonding takes precedence over development in any other area. “…[it] builds upon their strengths and abilities.” – This is encouragement that our children need. They are constantly bombarded by negative, both from the outside and from within. “…through interacting and creating a warm relationship.” – What could be better? This is what our ultimate goal is for our children with attachment issues. We want them interacting with us (by the way, that begins with constant effort on our end), and we want to create a warm relationship. Some of you who have a child that struggles day to day may not think a warm relationship is possible, but it is! Your connection with each of your children will look different, but you will be amazed at the gem you find beneath the hurt, anger, and fear your child is holding onto. Now that we have seen the benefits of Floortime, let’s find out how to do it. There will be a progression of steps. After you feel your child is comfortable with one of the steps, move to the next one. How will you know your child is ready for the next step? They will share smiles, engage you by handing you a toy, open discussions with you, they might make eye contact for the first time, or for longer periods than they have before. If you move on and you notice they are moving away from you or avoiding you, return to the previous step and work through it some more. 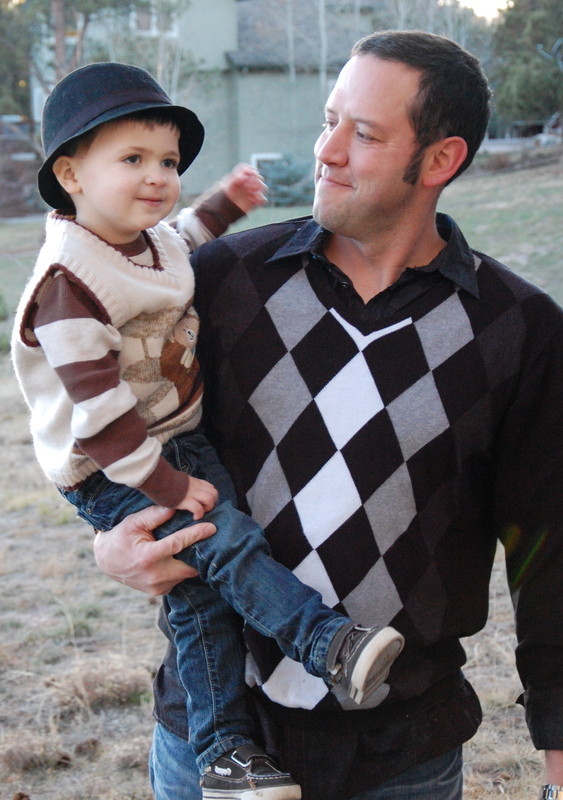 At any of the stages you can begin touching your child on the back or arm. See how they respond. If they squirm away, try again the next day. Don’t force it, but don’t avoid it either. You will begin by sitting next to your child and engaging in parallel play. (This can also be done with older children, which I will touch on in a moment.) “Parallel play is a form of play where children play adjacent to each other, but do not try to influence one another’s behavior…the children do not play together, but alongside each other.” www.wikipedia.org For our purposes, this will be done between an adult caregiver or parent and a child. We’re going back to those fundamentals they never learned and have difficulty with. Sit next to your child and engage in a similar activity. Don’t talk, only mimic what your child is doing with your own toy/book/body. It may feel goofy at first, but trust me, it works! If your child is pretending to drive a car, do the same with your own. If your child is looking at a book, sit quietly next to her reading one of her books. This will lay a foundation to build on. Be sure that you are engaging in something they have found interest in. You will do this every day if at all possible. The more you work on it, the faster bonding will come. I would begin with short sessions, around ten to fifteen minutes. Older Children (including teens): It’s the same concept as above, but obviously they will be more advanced. If your child enjoys coloring or drawing, sit next to her and do the same with your own paper. Whatever they enjoy doing, do it sitting next to them. Get involved with them at a basic level, being quiet, and letting yourselves exist in the same space. Next you will begin talking about what you are doing with your child. If your child has a difficult time looking at your face, bring toys to the bridge of your nose, so your child will look at your eyes. If your child looks at you say, “Thank you for looking at me,” in an excited voice. For a very young child who is beginning to talk, you describe what you are doing: “I’m driving the car. You’re driving the car.” Praise a child of any age when they do well (be real, they’ll know if you’re lying). Don’t say anything negative at this time. Older Children (including teens): Talk about what you are doing with them. You can ask them some questions, but keep those few and brief. Now you can begin interacting more, and exchanging in play. You can begin to play with their toy with them. You can read a book to them, invite them to sit in your lap to read a book or sing a song. If you have a girl that’s interested in doing your hair (come on Dad :)), take turns playing salon. This is a great opportunity for your child to practice taking turns, caring for someone, and appropriate gentle touch is always positive. Older Child (including teens): If you have a child that likes sports, you can play ball together. This exchange is a great back and forth play, your child is facing you, and they may also open up more and want to talk. Embrace what your child likes. Involve yourself by interacting and being interested. When raising children with attachment issues (and for me, having an added child with Autism) it can get quite discouraging. You try something, it doesn’t work, so you try again, and again it fails. Keep trying. I have often put something on that back burner for a long time because I tried dozens of times and failed. Then one day I would try it again, and suddenly it would work! Be persistent and eventually your child will be ready for that hug, or respond to that “thank you,” or whatever you might be wanting your child to do to show connection. 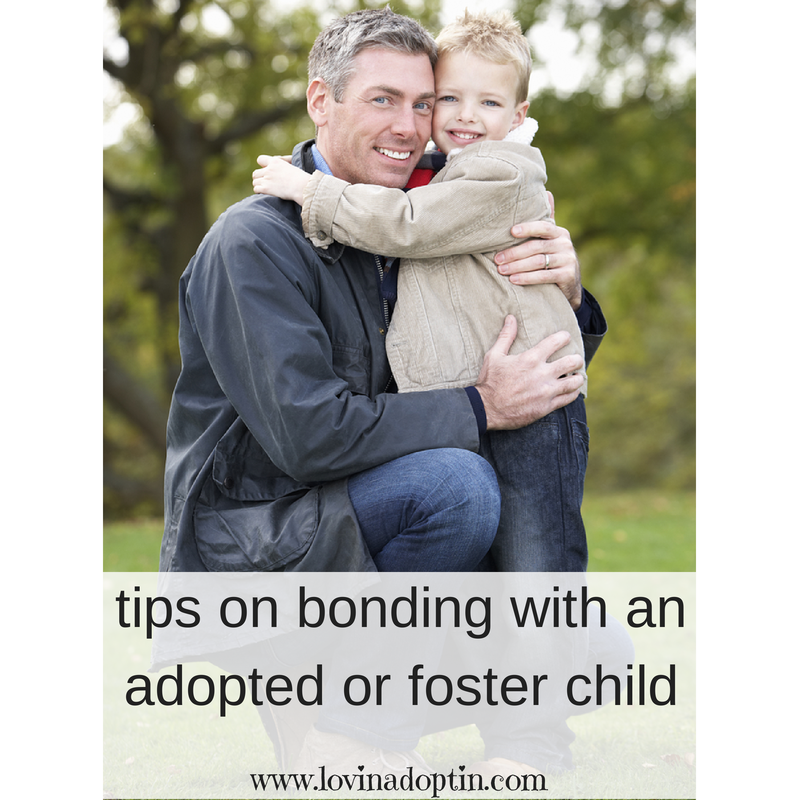 You can bookmark this post to refer back to as you work on bonding. You can also receive each post made to Lovin’ Adoptin’ by subscribing in the upper right corner. If you’re on a mobile device, you can do this on a web version. You can also follow me on Facebook, Twitter, and Pinterest. This entry was posted in Uncategorized and tagged adoption and attachment, bonding with adopted child, bonding with foster child, Dr. Bruce Perry, floortime, Stanley Greenspan. Bookmark the permalink.